Mum of triplets needs abdominal separation repair surgery. Mother of triplets can't get essential surgery she needs. Sydney mother, Kimberlee King, needs critical surgery to repair her abdomen. She told Mamamia that she’s always had big babies. 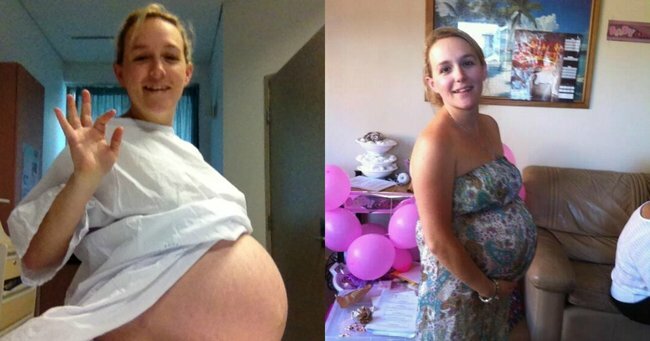 Her first baby was 4.1 kilograms, and her largest baby was 4.4kgs. And as a petite woman, being pregnant with big babies has taken a huge toll on her body. Kimberlee had ongoing abdominal wall issues with all three of her first pregnancies. But her last pregnancy, naturally conceived triplets, has severely damaged her abdomen. Kimberlee told Mamamia that she has chronic and debilitating back pain and incontinence. It affects her capacity to work and to lead a normal life. Every morning she wakes up, she wakes up in pain. She doesn’t drink as much water as she should. "I can&apos;t be playing with the kids as much as I&apos;d like to. I have no core strength." Image supplied. "If I&apos;m needing to go to the toilet I can&apos;t hold it. And that&apos;s because there&apos;s nothing holding my organs in the right place and all my organs are putting pressure on my bladder. "I can&apos;t be playing with the kids as much as I&apos;d like to. I have no core strength. Exercising any part of the core is dangerous. I was advised not to until my muscles were repaired." The triplets are now four years old. "It was probably about the beginning of this year, I had this break down moment. It was hot. I was laying on our floorboards just to get some relief because I was in so much pain. I thought &apos;You know what, I can&apos;t go on like this&apos;. "Exercising any part of the core is dangerous. I was advised not to until my muscles were repaired." Image supplied. "I knew I would always need to my muscles repaired but the timing now was right for us. Because the girls were old enough, you know they are quite independent - because it&apos;s major surgery. "In the next breath she said it will all be out of pocket because in January the Government took the surgery off the Medicare schedule." To be clear, abdominoplasty is still on the Medicare schedule, but there are strict criteria applied to funding, limiting it mostly to patients who have lost large amounts of weight to have extra skin and tissue removed. Surgery in situations like Kimberlee&apos;s is considered cosmetic, despite the fact that Kimberlee requires the surgery for medical reasons. "I think there needs to be some consideration for certain cases, definitely," Kimberlee says. Image supplied. Kimberlee is asking the Government to review the decision to allow women in situations like hers to access Medicare funding for abdominal wall repair surgery, as are over 2000 petitioners on Change.org and the Australian Society of Plastic Surgeons. Dr Dan Kennedy, a spokesperson for the Society told Mamamia, "What the changes mean, for example, is that a man who has undergone extreme weight loss after bariatric surgery can have his abdominoplasty reimbursed under Medicare, and yet a woman who has incurred torn muscles as a consequence of childbirth can not." "I think there needs to be some consideration for certain cases, definitely," Kimberlee said. Mamamia sought clarification from the Minister for Health, Sussan Ley in relation to Kimberlee King&apos;s situation. Her office noted that the decision made to remove surgeries like the kind Kimberlee is seeking from the Medicare schedule was made by an independent committee. Her office also noted that a member of the Australian Society of Plastic Surgeons sits on that committee. Ms Ley&apos;s office also noted that decisions in relation to the Medicare schedule are not final and may be reviewed at any time through appropriate channels.